1.1	Every runner is responsible to fully understand and know Race Rules, Obstacle Rules and how to do proper Burpees before event. 1.2	If some runner do not understand Race Rules it is on his responsibility to ask organizer before stepping on start line or before obstacle. 1.3	Any verbal or written instructions provided by emails before race, by race director briefing or by volunteers on obstacles or by course marshals may have priority before this written Race Rules here. 1.4	Competitors run in various Heats (start waves), in groups of 250 runners in each heat. The first two heats are Elite Heats, separately for men at 8:00 a.m. (Elite Heat Men) and for women at 8:15 a.m. (Elite Heat Women). Next heat is Age Group Heat for both Men and Women but individuals only. Age Group heat can be extended to more heats depends on interest. After last Age Group Heat is going first Open Heat. The first Open Heat is followed by one or two heats of the STG (Spartan Training Group) – special heats intended only for members of training groups from particular cities. Other heats which starts at 10:00 a.m. are open (Open Heats), and both men and women can run in them together. 1.5	Usually, start heats follow each other in 30-minute intervals but the intervals may be shortened to 15 minutes or even less. Start times of all heats may be shifted, depending on discipline, weather, season and number of registered competitors. 1.6	The fee for participation in the Elite Heat is 15€ in the Age Group is 10 € and entry to the first Open heat requires extra 8€ fee. 1.7	Competitors must run in the time heat to which they registered. If a competitor will run in other time heat than he registered to, he will be disqualified (DQ) and such participation shall even not be taken into account for qualifications to Trifecta. Any participant who starts in an incorrect wave shall be ineligible for awards including qualification to any championship events. 2.1 Our improved CEU registration system require for everybody to create one time mandatory profile (personal account within registration system) prior to registration to any event. Creating profile make easy for each participant to manage their present and next events, to make easy online substitution, to make changes within heats, to create invoice and Trifecta reports within CEU. Such online changes are available till last Tuesday before event. for free. Each online change in profile will require the service fee 5 €. 2.2 All competitors are required to indicate complete and correct data in the registration form. The score evaluation is also affected by the age of a competitor. Incorrectly indicated date of birth on the registration form shall result in disqualification without any refund of entry fee. 2.3 Team captains should not indicate their own email and their own phone number for other team members in the registration form. Each team member must indicate own e-mail and phone number in the registration form. Note: Registration for STG members to STG heats has slightly different procedure. 2.4 Registration changes could be done before a start but not after reaching a finish line. 2.5 Switching registration between individual and team and vice versa is not possible. 2.6 Any changes in the registration made at the day of the race are considered as additional service and fee 10 euro will be required. Knowledge of the proper overcoming of obstacles is the basis of success. Obstacle Manual is basic part of Race Rules. For detailed OBSTACLE MANUAL please click HERE. 4.1 Failure to follow specified route and use of shortcuts. An athlete is responsible for staying on the route. Athletes should understand that quick and correct orientation is also part of this sport – obstacle run in the field, and it is necessary to have certain abilities and skills necessary for successful completion of the race. Intentional altering of the route marking by an athlete or his/her associates falls into the category “Unsportsmanlike conduct”, according to these rules. The athlete who intentionally or unintentionally leaves the route, not being able to get back to the route point where he left it, will be disqualified. In some cases, caused for example by weather, reduced visibility or incorrect instructions of organizers, such violations can be solved individually, case by case. 4.2 Leaving or dropping of any part of clothing, shoes or equipment with which a competitor originally started on. Each part of clothing and equipment must go through all obstacles and nothing can be left on a route. We mean also camel-bags, flags, decorations, wigs, masks, costumes, etc. It is forbidden to use any masks, decorations and costumes in all competitive heats – Elite and Age Groups. 4.3 Skipping of obstacles by running next to them. 4.4 Running without the Race Number – starting number (BIB) or its intentional covering, soiling, hiding, or removing of the starting number. Each competitor has to be identified with his/her starting number – headband with the number flipped forward on his/her head. The headband must be carry visible all time on the track from start corral to the finish line. Wearing headband on the neck or on the wrist is not acceptable and will result disqualification. Use of prior race numbers will be grounds for immediate DQ and suspension from future competitive Spartan heats for a period as determined by Spartan officials. 4.5 If men use the load intended for women. 4.6 If men use help steps intended just for women on the Wall. 4.7 Masking the timing chip with opaque adhesive tape (duct tape – silver adhesive tape) in order to avoid its loss but causing malfunction of the chip itself. 4.8 Every person who throws waste on the route, outside of refreshment station or obstacle, will be disqualified. 4.9 Acceptance of help from others. Outside help. It is not permitted to accept help from audience or from members of support team. Competitors may not accept equipment, clothes, shoes, water nor food on a route, unless it is from organizers. There is no penalty for verbal communication with medical staff or acceptance of help and support from other competitors, with the exception that the Elite competitors cannot help each other on obstacles. Any form of physical therapy by medical personnel will result in immediate disqualification. 4.10 Acceptance of help from other runners. Inside help. It is forbidden to give and accept help between runners of Elite and Age Group heats on the course. Breaking this rule lead to disqualification. Only runners of Open heats can help each other. 4.11 Failure to comply with Cut-off time. Cut-off time may be given for some races (usually for Beast and Ultra disciplines). Most often it is due to the safety of athletes. If the Cut-off time will not be met, a competitor is obliged to resign and he/she will be disqualified. The Cut-off time for completion of the race is given by the Director of the Race prior to the race and it is published in Athlete Guide for given event. Each obstacle have to be completed and each penalty exercise must be made correctly and in full. If a competitor can no longer proceed on due to physical or mental exhaustion at any part of a route, he/she may withdraw from the race. All those who give themselves up shall notify the referee on a obstacle or the course marshals. First, they will take the timing chip away on-the-spot and all the other bands, and then, if it’s necessary, provide transportation to festival area. In case runner will give up on track between obstacles and nobody from organizers took his timing chip he must bring it to the timing company at finish line such way to avoid of scanning his chip by timing mat. No participant shall, at any time during the event, use or wear a hard cast, crampons or metal studs, outside rigging, headset, radio, personal audio device, or any other item deemed dangerous by the Head Referee. Unless otherwise provided for in these Rules, any violation of this Section shall result in DQ. It is forbidden to use tourist, trekking or ski sticks, metal spikes on shoe soles, etc. Also any kind of natural wooden sticks found by track are forbidden to use. Using of running shoes with metal/plastic or other material spikes. Also any kind of aid tool installed on shoes called – „snow traction aid“ or „anti slippery aid“. Such shoes and aids are forbidden for winter and same as for summer races from safety reason. Runners who will use such forbidden shoes will be disqualified. 5.1 Elite/Age Group runners cannot accept any help “from outside”. If a competitor accepts any help from persons who are not competing, e.g. audience, member of service or support team, including official medical assistance on a track, e.g. : quick bandage, Advil, ice pack, giving drinking water by audience, or if someone from audience helps him/her and gives him/her hand during obstacle overcoming, then the competitor loses entitlement for all prizes and will be assigned only with an unofficial time. He/she will receive only medal and T-shirt. Elite/Age Group Wave competitor will not be penalized for verbal communication with medical personnel. 5.2 If additional video check reveals that an Elite/Age Group runners didn’t do proper penalty exercise, he/she will be penalized with 30 seconds for each incorrect burpee. If the video will evidently reveal that a competitor made less than 20 proper penalty exercises, he/she will be disqualified additionally. 5.3 Any competitor’s protests regarding preliminary results, breach of rules or route, or complaints on behavior or acts of other competitors can be declared no later than 1 hour prior to the award ceremony, or as stated in Athlete Guide for given race. •	a. Hydration sources such as – water bottles (no glass), pouch, bottles strap, camel-bag, etc. •	b. Mandatory equipment for competitors who take part in start heats after 11:00 a.m. at Beast is a headlamp. For the Ultra – all competitors from all heats must have a headlamp. Racers who will not have this equipment will not be allowed to race at all. 6.2 Ultra competitors have to meet certain Cut-off Time on the route, otherwise they will be withdrawed from the route and disqualified. Cut-off time will be announced in Athlete Guide for each race minimum 14 days before race. Each participant is expected to behave in accordance with spirit of sportsmanship during the whole sporting event. Unsportsmanlike behavior is the reason for disqualification, exclusion from the competition, expulsion for one year, or lifetime exclusion from all races, depending on the fault severity and on the decision of organizers. Runners may not arguing with the referee, course marshal, obstacle volunteer, staff member etc. Argues will be considered as Non-Sports behaviors. Instructions or commands of obstacle volunteers or referee shall be fulfill without delay, otherwise it will lead to disqualification. Unless they feel they have been unfairly treated have the right to give a protest when they rich the finish line. Slow competitors must allow faster athletes to overtake. Participants shall refrain from intentionally or accidentally blocking, charging, obstructing, or interfering with the forwards progress of another participant. Obstructing of faster runners in overtaking at any part of a route will be classified as „Unsportsmanlike behavior” and results DQ. Every person who throws waste on the route, outside refreshment station, will be disqualified. In addition to the refreshment stations rubbish may be left also on obstacles which are equipped with the garbage bags or plastic bins. If a competitor is a witness to accident and injury which require immediate medical attention, he/she cannot continue on until someone from organizers reach the place. Failure to provide help to the competitor in need of such medical assistance will be considered as “Unsportsmanlike behavior”. Each competitor is expected to use his/her own best judgement in regard to seriousness of the injury in order to decide if he/she should stay and help the person in difficulty and need, or run for help to the nearest obstacle. A competitor have to understand that his/her decision in favor of injured person could jeopardize his/her own time result. In such cases, a competitor must take the cognizance that additional time compensation for time loss caused by granting such assistance is possible but not guaranteed. Athletes are required to complete their penalty burpees within the designated Burpee zone or area, as burpees are monitored by Course Officials and/ or video cameras. Course officials will review video to ensure proper form is used and the athlete has completed the burpee penalty. Burpee zones are there for safety and to allow for athlete flow on course. Blocking other Athletes progress by doing penalty burpees in the athletes path falls under the rules of “unsportsmanlike conduct”. Burpees completed outside of the Burpee zone will not count toward the 30 burpee penalty. Go into squatting position and put your hands on the ground in from of you. Kick your legs behind yourself so that you get into position for push-up. Make a push-up so that your chest touches the ground and go up again. Kick your legs back under yourself so that you get into squatting position. Stand up and jump with straightened body. While you are in the air, lift your hands above your head. •	A competitor doesn’t touch the ground with his/her chest. •	A competitor doesn’t jump. •	He/she doesn’t jump with straightened body. •	He/she doesn’t rise up hands above head. •	A competitor doesn’t make the whole set of 30 burpees. We recommend to say out loud every fifth burpee. 7.6.2 Counting. A competitor is responsible himself/herself for correct counting of penalty exercises. He/she cannot anticipate that someone else will count for him/her. He/she should say loudly every 5th burpee during performing penalty. A competitor have to comply with instructions of the obstacle referee. If the referee doesn’t recognize some exercises, a competitor have to repeat penalty exercises. 7.6.3 Time penalty. Missing more than 10 burpees at outdoor events or more than 5 burpees at Stadion events at a single obstacle will result in a 10 minute penalty. The conduct of any agent acting with apparent authority on behalf of a participant shall constitute grounds for penalizing such participant if such agent’s conduct violates any of these Rules. No spectators are allowed on course outside of specific zones designated for spectators. Spectators include all competitors who have already completed the course. Pacing of athletes (pacing is defined as the practice running in front of or alongside another competitor) is strictly prohibited. Any person who participates in any portion of an event without first properly registering and paying any required registration fee shall be suspended or barred from any Spartan event for a period of up to one year. Any person who in any way assists another athlete to violate Section 4 by providing a race bib to that athlete shall be suspended or barred from any Spartan event for a period of up to one year. Any second violation of this Section can result in a lifetime suspension or ban from Spartan events. All obstacles must be attempted. An attempt, at a minimum, is defined by touching the obstacle. In other cases it may include entering the water or other difficult terrain, to get to the obstacle itself. Such terrain cannot be bypassed via penalty burpees, unless advised as acceptable in pre-race briefings or by race day staff/volunteers. All Competitors are given one attempt to complete each obstacle. What defines “an attempt” is outlined within the race specific rules that follow. However, typically once both feet have left the ground you will be considered come to that obstacle and must complete it or take the penalty. In the case of obstacle failure caused by significant physical interference from an another athlete, the affected competitor may restart the obstacle with no additional penalty after receiving permission from an official. Competitors may only strike bells present on ANY obstacle using their arms and hands, or any other part of their body above their chest. Using feet, legs, or knees to “kick” the bell is not allowed. Violation of this rule will be considered an obstacle failure. The competitor will not be allowed to retry the obstacle, and must complete 30 burpees or the mandatory penalty for that obstacle. 8.1 SR season 2019 will have these categories: Elite, Age Group and Open. Awards will be for Men, Women in the Elite and Open category also teams. Age Group category has rewards for individuals only – Men and Women. Age Group Category has 10 groups divided by age: 15-17, 18-24, 25-29, 30-34, 35-39, 40-44, 45-49, 50-54, 55-59 and 60+. Each age group will have award for top 3 male and top 3 female (individuals only). Total will be awarded 60 runners from Age Group category. 8.2 Spartan Kids will have awards only for oldest kids from age category 11-14 years. First three boys and first three girls will get winners medals and diploma. 8.3 Season 2019 will have series called CEU Regional Series. This series will count only points from particular events organized by CEU. Points will be counted only from four fastest events. Last event Beast is mandatory. Final results will be published after last event – BEAST in Valčianska Dolina. Top 10 men and top 10 women from Elite will be awarded with financial prizes. 8.4 Runners awarded with free tickets can use tickets for following race of the same discipline or discipline one level above. These free tickets are non-transferable and cannot be used by other persons nor alternates. Free ticket is valid for one year from award ceremony in CEU region. 8.5 Awards ceremony must be attend in person, the winner can not delegate a representative. Prizes for winners who will not attend award ceremonies in person shall forfeit. Nothing will be sent by post. – go to under ID check to verify theirs personal data and DOB. Winners who avoid to go under ID check will not be allowed to attend award ceremony. – have to fill out all required financial paperwork. – adhere to any and all Anti-Doping controls in place at the given Race. 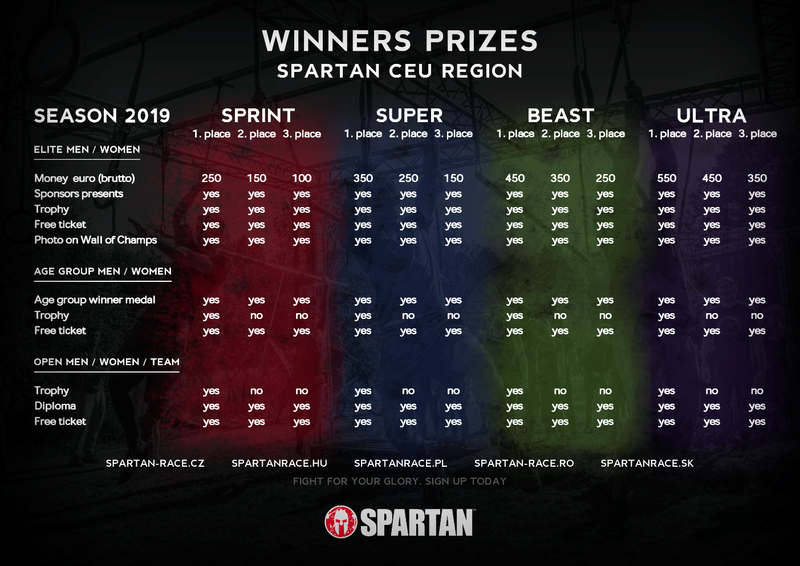 – must wear Spartan Finisher T-Shirt for the award ceremony in order to receive prizes. Not adhering to any of these protocols may result in DQ from the event and forfeiting of prize money. 8.6 A competitor is responsible for correct mounting and wearing of timing chip through all check points on a route and at a finish. 8.7 If a competitor loses his/her timing chip, he/she has to inform the timing company about it immediately at a finish. Such competitor won’t have his/her official time confirmed until it is approved by the Director of the Race. 8.8 Any loss of the chip, or missing record from a check point, may lead to disqualification. 8.9 Course Marshals can be helpful in confirming a route to a competitor who lost the chip or his/her chip didn’t record the check point time. 8.10 The Spartan Race reserves the right to revise all videos and photos from the race and based on findings change results or additionally disqualify competitors. Penalty 30 seconds for every missed burpee. If an athlete does less than 20 burpees then he is penalized by 10 minutes. 8.10.1 Non-Spartan Videos: Races officials are not obligated to consider non-Spartan videos during the video review process. 8.10.2 Time Penalties: During the race or during the post-race review period prior to the awards, if it is determined that a competitor attempted and failed a Pass/Fail obstacle but did not serve their penalty, they will be issued a 10 minute time penalty. 9.1 Qualification for European Championship 2019. The European Championship 2019 will be host in Dolomiti, Alleghe-Civetta on June 29th 2019. All events between September 30, 2018 and the Sunday before the European Championships will be able to offer the possibility to qualify for the Championship race. • TOP 10 men/women finishers from all Elite race heats (with roll down) at all regular season races in Europe. • TOP 10 men/women finishers from each age bracket of all Age Group race heats (with no roll down) at all regular season races in Europe. Other details about proper procedure to register for EC will be published on official web page of organizer. 9.2 Qualification for World Championship 2019. The World Championship 2019 will be host in Lake Tahoe, USA on Sunday Sep 29th 2019. • TOP 10 men and TOP 10 women of Elite from CEU Regional Series final leader-board with roll-down. • TOP 3 men and TOP 3 women of Age Group from CEU Regional Series final leader-board with roll-down. • TOP 20 men and TOP 20 women of Elite and Age Group from European Championship with roll-down. Elite spots are scarce with just 600 total elite spots available (300 men / 300 women). There are only 2000 spots for age groupers (200 per age group, 100 male / 100 female). 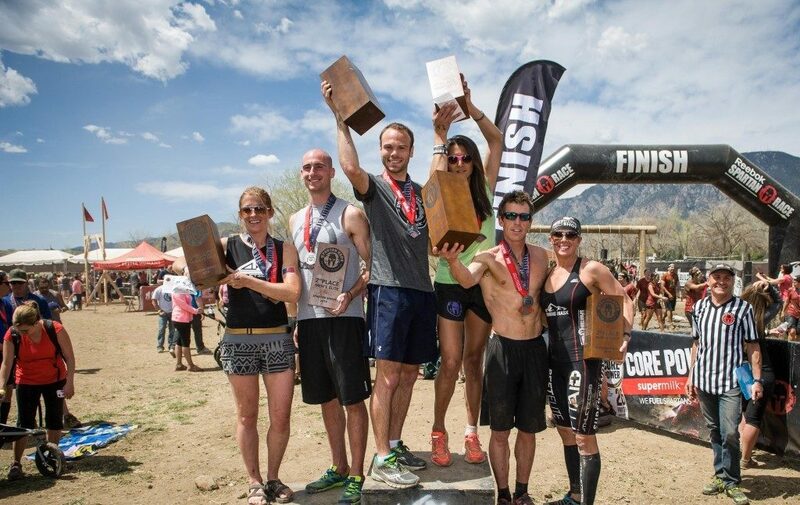 a) All Elite athletes (male or female) who have previously placed first at the Spartan World Championship earn an automatic qualifying spot at all subsequent World Championships. b) Any Elite athlete male or female who place in the Top 10 at the 2018 World Championship earns an automatic spot in the 2019 World Championship. c) All Elite athletes who have placed first at a Spartan Championship or National / Regional Series (eg. European, North American, US National Series, Ultra World Championship) since 2016 earn an automatic spot in the 2019 World Championship. d) Any Age Group athlete who places first in their category at the 2018 World Championship earns an automatic spot in the 2019 World Championship. e) Spartan HQ reserves the right to invite any other athletes who have a significant profile to any championship event. •	Immediately after age group awards at each National series final + championship. •	Runs until the following Sunday. •	For example: North American Championship roll-down begins August 25, 2019, European Championship roll-down week begins June 30,2019. •	Given to athletes present at the event with roll-down. •	Email invitations sent for all remaining spots post on-site roll-down. •	Email invitation is sent with a unique code. •	Email invitation sent to remaining qualified athletes. 9.3 Qualification for Trifecta World Championship 2019. The Trifecta World Championship 2019 will be host in Sparta, Greece on Nov 1st 2019. In order to qualify for the TWC you have to complete a Trifecta in either 2018 or 2019 – before the TWC race date. You do not need to have completed a Trifecta before you complete the process of registering, but you can then only actually race in Sparta if you have completed a Trifecta before that event. If you did not get your email by that date- please email info@spartanrace.gr with your name, surname, date of birth, and the races you completed in 2018 in order to complete your Trifecta. Once you are verified as having completed a Trifecta you will receive a password to access registration. From January 15, 2019 will be open registration for runners who will not finished their Trifecta but they plan to earn in 2019. If you do not complete a Trifecta before October 31 2019 you will automatically be removed from the registration for the event and be ineligible to race. There are NO refunds in this event, so please do not sign up unless you are sure you will complete your Trifecta before October 31. There are no exceptions. 9.4 Qualification for Ultra World Championship 2019. 9.4.1 All 2018 Ultra World Championship registered competitors gain automatic entry. 9.4.2 All 2018 Elite, Age Group and Open qualifiers who did not attend the 2018 Ultra World Championship get a “second chance” entry via email in January 2019. 9.4.3 Qualifying rules otherwise remain the same for all 2019 Ultra competitors, with cut-off times for Elite (10 hours), Age Group (13 hours), and Open (16 hours), with a mid-course cut-off of 8 hours. 9.5 Qualifications for KIDS World Championship 2019. The qualifying system for the 2019 Kids World Championship is simplified. Any child who has completed a Kids Competitive heat in 2019 automatically qualifies to attend the World Championship. Spartan recognize two types of Teams. 10.1 Teams created to get group discount. In the registration system you can get group discount on registration fee which depend on numbers of your team. Such teams can be created at all regular events through all CEU season. Teams can run any heats – STG and Open except Elite and Age Group Heats. a. Each team consisting of 4 or more members will be included automatically into the team evaluation. In order to be evaluated, the team must have at least 4 members who finished the race. b. Times of all team members will be recorded. c. Only the time of fourth top team member, will be included in overall evaluation of teams. Decisive for the team ranking is the time of the 4th athlete of the team in the finish. It’s not about the best 4 or more individuals but about the best team effort. So run through the course together as a team and you will get in with a better team time. d. Teams can be divided into different heats and doesn’t have to run together. e. Teams can be mixed – men and women together. f. A competitor registered as an individual cannot be evaluated and awarded as a member of a team. Such teams are created only on special events. Teams run in special Teams Heat only. a. Three athletes per team. b. Teams must all be one gender – all male, or all female. c. All three team members must be citizens (passport holders) of the same country, and must compete together at the same event (no separated qualifying). e. A naming convention applies for teams entering qualifying events. Each team’s name given during registration must always include the country of citizenship of its members as the first word of the team’s name. For example, Australia Dusty Kangaroos, USA Johnsteam4, Singapore Warriorz. represent their country. Expatriates and tourists may compete abroad but within their country’s region in order to qualify to represent their home country. g. Where multiple repetitions of an obstacle are required, all team members must complete at least one repetition. Further repetitions may be completed by any combination of team members. h. All obstacles must be attempted by all team members. i. Assistance is not allowed on any obstacles unless specifically stated otherwise. – This includes intentionally manipulating any swinging or grasping elements of obstacles such as cowbells, or hanging elements of multi-rigs, twister, or platinum rigs. j. Where allowed, a competitor may only receive or give assistance within their own team. No outside help is allowed. – A team may only field qualified members at the Team World Championship. In the case of a team member being unable to represent their team due to illness or injury, the team may call on their emergency substitution by contacting cs@spartan.com and ensuring that person is registered. In the case another member is unable to complete, the entire team will be disqualified and the next ranked team qualified in their place. (a) Each team’s finish time is based on the average of all 3 members. (i) Competitors A, B, and C race together as a team. (ii) A finishes in 1:10:15, B in 1:10:25 and C in 1:10:55. (iii) The team’s official finish time is 1:10:31. (b) All 3 team members must finish within 1 minute of each other or the team is disqualified. (c) One or more members failing to finish shall result in all 3 members being disqualified. (d) If any team member loses their timing chip, an unofficial manually calculated result will be given. The entire team becomes ineligible for a podium placement. (e) All three team members must attempt every obstacle. Skipping obstacles or completing burpees without an attempt is not permitted, and results in a DQ. (f) Each team member that fails an obstacle with a burpee penalty must complete 30 burpees. (i) 90 burpees is the maximum burpee penalty any team can receive per obstacle. (ii) Any team member may begin completing a burpee penalty as soon as they fail an obstacle, so long as they are in the designated burpee zone. (iii) Burpees can not be shared among team members. Each team member failing an obstacle with a burpee penalty is responsible for individually completing 30 burpees. (g) All Burpees should be performed in the obstacle designated burpee zone, in clear view of the zone’s camera or as directed by a Spartan Official. (i) If teams are competing on course with Open category competitors, where possible a separate burpee zone for teams should be designated to allow officials to focus on teams. (h) Specific sections of the course that are technical, remote, or subject to unique environmental conditions may include cut-off times, at the discretion of the Race Director and QM team. For season 2019 for all regular events were approved these prizes: Click Here. TEAM CHALLENGE for WC (occasionally on selected events). For all free tickets apply the limitations by paragraph 8.4 of these rules. Financial prizes are brutto. The prize doesn’t have to be awarded at each race. It is awarded occasionally for notably honorable, human, and sporting act. 12.1 Prior to the results being considered final, an official video review process will take place. Therefore, a race’s final results may not be posted on-site immediately, pending this official review. 12.2 Penalties found during this review are displayed real-time on the display monitors inside the Results Tent throughout the Official post-Race video review process. It is the athletes sole responsibility to check these penalty display monitors until the awards ceremony in the event they would like to protest any penalties administered by the Head Official. not present, or who are unavailable during the event. and protest it during the allowed protest period. 12.5 Any competitor’s official protests regarding preliminary results, DQ, penalty issues, breach of rules or route, or complaints on behavior or acts of other competitors can be declared no later than 1 hour prior to the award ceremony, or as stated in Athlete Guide for given Race. 12.6 Official protests shall be declared verbally, directly to the Race Director. 12.7 Prior to the official protest the protest fee (30 €) must be paid in Registration desk. 12.8 In the case of justified protest, the fee will be returned. 12.9 Spartan reserves the right to change the standings or race day decisions indefinitely after the event, in cases of unsportsmanlike conduct and/or intentional or malicious breaking of the rules, including but not limited to, failing of any Anti-Doping and Drug Control protocol administered by Spartan Race or a third party as designated by Spartan Race. 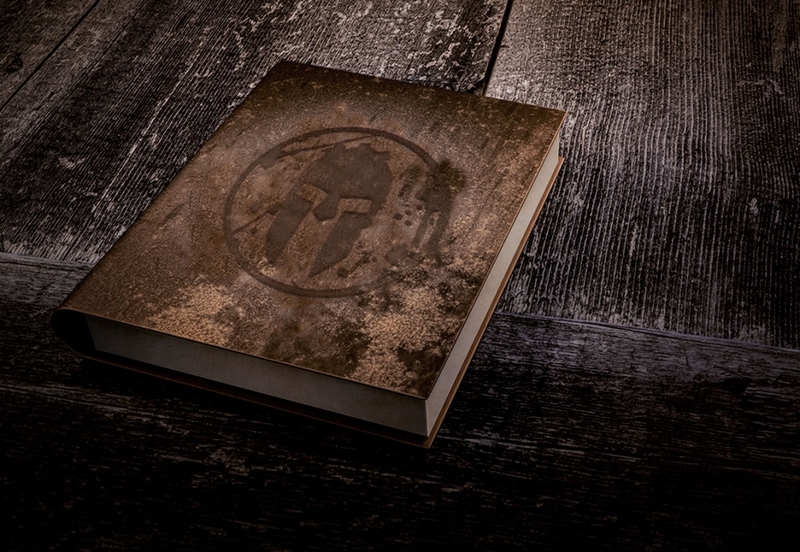 (i) First offense: 2-Year Ban from all Global Spartan events. (ii) Second offense: Lifetime Ban from all Global Spartan events. In the case of very bad weather or other natural disasters, or by other organizational or technical reasons, the organizers of the Spartan Race reserve the right to change, modify the part of, or the whole, route, as well as some obstacles, or suspend or terminate entire race on behalf of preservation of health and safety of competitors, organizers and audience. In the case that competitors will be requested to suspend or terminate an activity for above mentioned reasons, they shall do so immediately. Any verbal or written race day instructions given in pre race emails, pre race briefings, or by volunteers and/or course marshals will supersede rules in this manual. These rules are not final and will be continuously modified, updated and amended by the Director of the Race, depending on situation.